The T-70 Twister from Tornado Global Hydrovacs was on display recently at the 2019 WWETT Show in Indianapolis. The unit, which the company hopes will be on the market later this year, is one of many trailer-mounted vacuum units coming out this year. Investing in a large hydrovac unit isn’t always feasible for contractors like Jim Tieffel who don’t do a lot of hydroexcavation work to begin with. Currently when Tieffel, a plumbing contractor in Alabama, finds an underground pipe that needs replacing, he calls upon others to handle it. But he’s ready for that to change. “I’m tired of paying out that money when it’s something that I could easily take on,” Tieffel says. 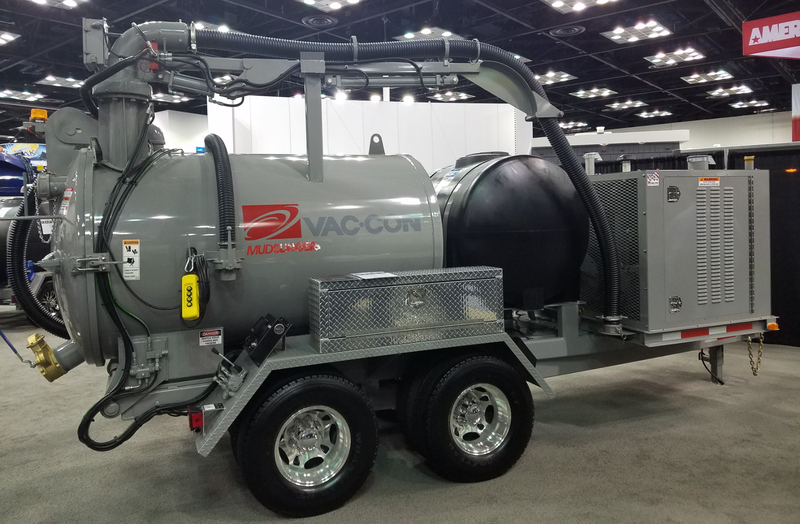 So at the 2019 Water & Wastewater Equipment, Treatment & Transport (WWETT) Show that was held recently in Indianapolis, a top priority for Tieffel was to check out the various trailer-mounted vacuum excavation options on the market — something much more economically realistic for his business. Among the options were units from Ditch Witch, Tornado Global Hydrovacs and Vac-Con, to name a few. Operating trailered units to expose and replace damaged waterlines is only one way the machines can be used. There are many others. Manufacturers have even started to see arborists use them to plant trees. Telecom companies themselves are starting to add units. Adam Russell of JD Brule Equipment, a Tornado Global Hydrovacs dealership, says his company’s trailer unit isn’t only for digging, either. Terry Rawn, who was an integral part of the design of Tornado Global Hydrovacs' trailer unit, says they are a way to introduce contractors to the market without having to buy the big $500,000 trucks. Tornado Global Hydrovacs' unit, called the T-70 Twister, has a 6-cubic-yard debris tank and is capable of holding 720 gallons of freshwater. The T-70 is powered by a Tier 4F, 74 hp Cummins diesel engine and has an industrial positive displacement blower capable of 1,200 cfm at 15 inches Hg. The water pump is capable of up to 5.6 gpm at 3,500 psi. The trailered unit has operator controls on the rear and is capable of wireless operation. “This unit will compete with the smaller chassis-mounted hydrovac units currently on the market,” Rawn says. The T-70 Twister is much like other trailer units from Ditch Witch and Vac-Con in that they can be easily hauled around with a non-CDL driver’s license. Vac-Con’s Mudslinger trailer-mounted unit can be fitted with either a 990 or 1,190 cfm, 16-inch Hg positive displacement blower and can have debris tank sizes of 535 or 845 gallons. The debris tank has a hydraulic dump hoist with a 55-degree dump angle. The Mudslinger water pump is capable of 4 gpm at 4,000 psi. Ditch Witch’s lines of trailered vacuum excavation units have been on the market a number of years, but the company continues to make improvements to them. The HX line of trailer excavators has standard cyclonic filtration, adding extra filtration before material is delivered to the debris filtration. The HX50, equipped with a 49 hp Kubota diesel engine, features a 1,005 cfm blower and a water pressure capacity of 3,000 psi. The boom is capable of 330-degree rotation. The HX30, powered by a 24.8 hp Kubota diesel engine, features a 512 cfm blower and a water pressure capacity of 3,000 psi. 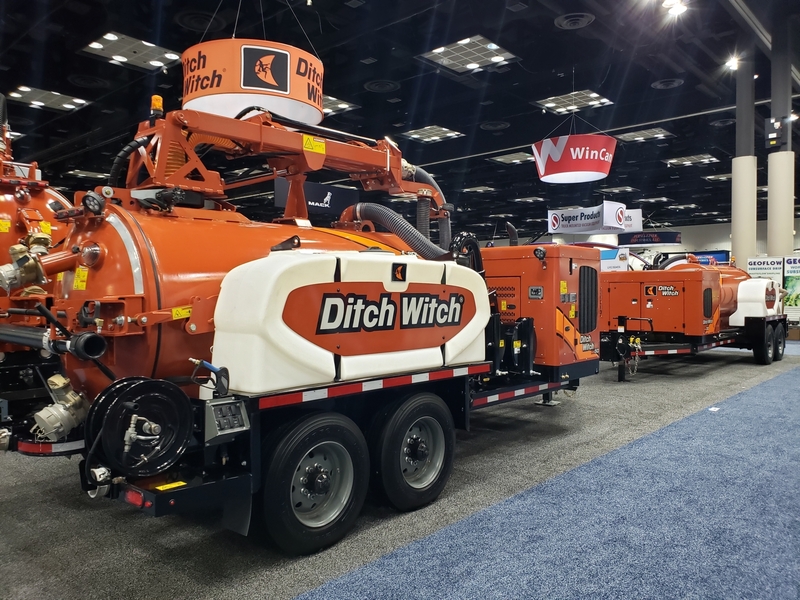 The Ditch Witch HX50, left, and HX30 trailer vacuum units were on display at the Water & Wastewater Equipment, Treatment & Transport (WWETT) Show in Indianapolis. These are just two models of trailer vacuum excavators the company has available. Trailer units make it possible for more contractors to use vacuum excavation without the price point of a large hydroexcavator. “If you look at the overall package, we’ve really made the trailer purpose built,” Hancock says. The changes between the FX line and the HX trailered units include taking out all the mesh lining on the deck, making the trailer itself the skid for the vac system. The overall height of the unit is cut down by 10 inches, and ground clearance is increased by 5 inches. The trailer is also 6 inches more narrow, allowing for easier access on job sites. By the end of the WWETT Show, Tieffel had gathered a few quotes from some manufacturers and knew he was going to make a decision in the coming weeks.